Where do I use my Andrew Martin voucher code? Discover a wide selection of furniture at Andrew Martin including chairs, sofas, side tables, coffee tables, console tables, stools, desks, dining tables, storage options and headboards all of which are available in different materials, styles and colours to suit all tastes and preferences. As well as furniture you can also shop for home accessories at Andrew Martin with huge stocks of wallpaper, fabric, cushions, artwork, mirrors, rugs, books, boxes, lanterns, sculptures and even fruits. If you’re looking for appropriate lighting to match the theme and ambience of your room you can also choose from ceiling lights, wall lights and table, desk and floor lamps in various styles and colours. One of the aspects of Andrew Martin, that sets them aside from other interior design retailers, is that they offer a custom design service. If you have a very specific style or piece of furniture in mind you can custom make it with Andrew Martin. With a selection of customisation options available for headboards, sofas and chairs, you can bring your vision to life with the help of experienced designers and quality carpenters. Andrew Martin has a very unique approach when it comes to furniture; pushing aside typical trends and fads that other interior design companies thrive off and, instead, embrace influences from different time periods and geographies to create original pieces that are individual in colour, texture and form. With chairs, sofas, side tables, coffee tables, console tables, stools, desks, dining tables, storage options and headboards in multiple colours and designs you are sure to find an original piece that’ll look great in your home. But, if you can’t, then simply create your own with the custom furniture service. Andrew Martin provides a great sale section on their website where you can find clearance pieces and end of line home furnishings that have massively reduced price tags. Shop for rugs, tables, sofas, chairs, cushions, lamps, mirrors, sculptures, wall art and much more all of which is discounted by up to 50%- allowing you to furnish every room in your house for less. Search for your required homeware in the sale section using the ‘product type’ search bar and discover hundreds of pieces in different styles within a few seconds. The sale section is often updated as each new season and line arrives, so make sure you check back to find newly reduced items each week. Yes. Andrew Martin charge 70p for all fabric and wallpaper samples. 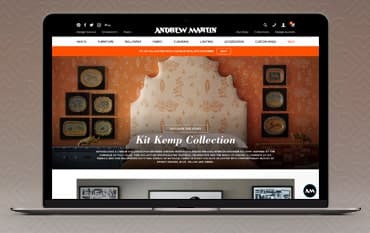 If you're not happy with your purchase, please email: webhelp@andrewmartin.co.uk within 14 days of delivery and include your sales order number and the reason for your return. Andrew Martin will then send you details on how you can return your parcel. How can I contact Andrew Martin? Andrew Martin is innovators in interior design, providing a huge array of furniture and home accessories as well as fabric and custom made furnishings for every room in your house. Shop for everything from sofas and dining tables to wallpaper and lighting and transform your whole house into a comfortable and stylish living space, without spending a fortune. And if you shop online with an Andrew Martin voucher code from us, you can keep costs as low as possible every time you shop.